While USD is under pressure because of the tax reform plan, ISM Non-Manufacturing PMI will be released today which might support this currency against EUR. 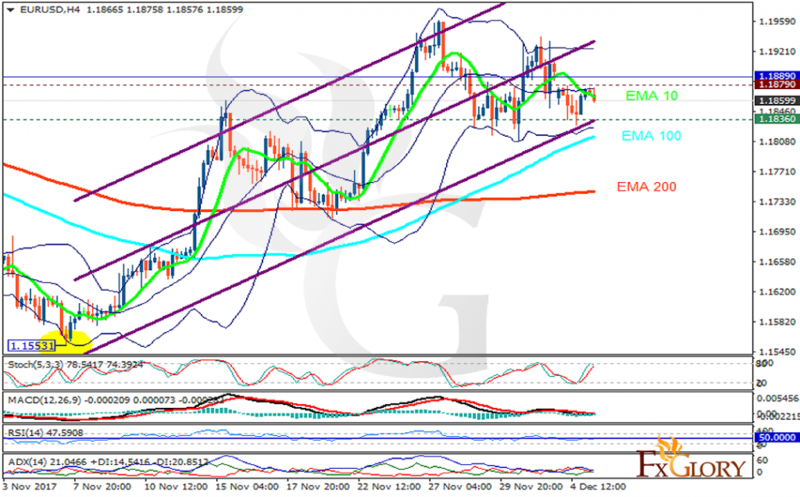 The support rests at 1.18360 with resistance at 1.18790 which both lines are below the weekly pivot point at 1.18890. The EMA of 10 is moving with bearish bias in the ascendant channel and it is above the EMA of 200 and the EMA of 100. The RSI is moving below the 50 level, the Stochastic is showing upward momentum and the MACD line is below the signal line in the negative territory. The ADX is showing weak sell signals. Indicators are showing mixed signals. The resistance level breakout will push the price towards the upper Bollinger band; otherwise, it will drop to 1.15.